Research on early childhood learning and education increasingly views children as active participants in their growth and development. Faced with sometimes puzzling choices for their own children education, parents are often left wondering about the best approach. The goal of this workshop is to break through the barrier between research/academia and families, and to help parents and caregivers navigate the decision process for pre-school. The discussion will be focused on children’s right to an education that supports them in developing to their fullest potential. We will investigate child-centered education approaches and inclusive education, and provide specific information about the services available in our community. 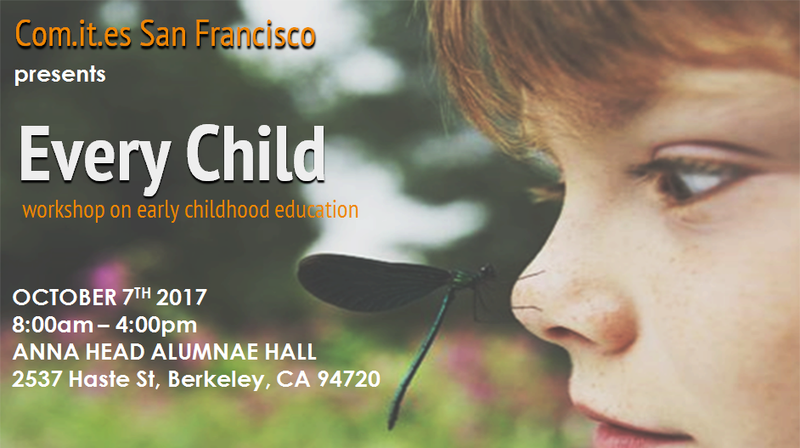 Please join us for an informative session with useful insights for everybody interested in early childhood education – an area where Italy excels. Click here for further details. 09:00 – 09:15 Welcome from the Consulate of San Francisco and Com.It.Es.